SOCASTEE, South Carolina—Carol Nash had lost her husband just months before Hurricane Florence hit, flooding and wrecking her home of 25 years. “I think we’re going to show her a little bit of hope as she rebuilds this house,” Howard Carter, a Samaritan’s Purse volunteer leader from Tennessee, told The Daily Signal in an interview at Nash’s storm-ravaged house in Myrtle Beach. Nash’s husband died in May. Hurricane Florence made landfall in South Carolina on Sept. 14, forcing over 1 million people in the Carolinas to evacuate, claiming the lives of at least 51 people, and damaging nearly 700,000 properties. 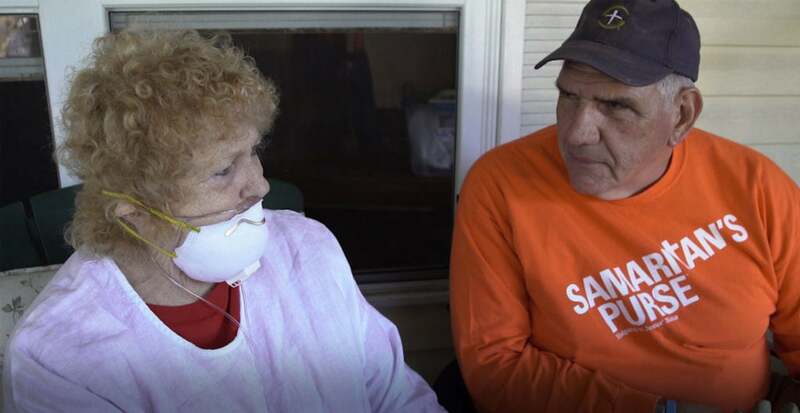 Carol Nash, left, with Howard Carter, who led a team of Samaritan’s Purse volunteers in gutting and treating Nash’s flooded home. (Photo: The Daily Signal). While those such as Nash who were hit hard by the storm have fallen out of the news cycle, Samaritan’s Purse has continued to serve residents in and around Socastee, which is about 8 miles outside Myrtle Beach. The nondenominational Christian aid organization gives spiritual and physical support to victims of natural disasters around the world. Staff and volunteers for Samaritan’s Purse help the residents begin to rebuild, a process that for some could take years. And they do it without government funds. When The Daily Signal visited, Nash’s unsalvageable belongings—including tables, chairs and other furniture; blankets and other linens; and keepsakes—were piled at the curb. Although nearly everything Nash has known has been washed away, Carter said, the most important thing he and his team of volunteers could do is show her love and give her hope. Lorenzo Torres, a program manager with Samaritan’s Purse who is from West Jefferson, North Carolina, told The Daily Signal in an interview that the organization had multiple teams “mucking out” flooded homes in the Socastee community. The process consists of removing the wet, moldy contents of a house such as flooring, cabinets, insulation, and wall material. Torres, 42, said his interest in Samaritan’s Purse was sparked in 2013, when he saw footage of tornadoes that devastated Morgue, Oklahoma, on television one day after he returned from classes. Torres said he volunteered off and on for about three years before joining the staff of Samaritan’s Purse. Torres said the relief operation in Socastee consisted of three staff members on-site and 65 volunteers in the field. As a whole, Samaritan’s Purse has a national pool of about 20,000 volunteers that it can deploy to various relief missions. “Samaritan’s Purse has not received any government grant funding for domestic disaster responses or projects,” Lahm told The Daily Signal. Torres said it is encouraging to see how Socastee residents responded to the work of the organization’s volunteers and staff. As our team starts working on our house, and as the day goes on, you start seeing progress. The homeowners start seeing that same progress, and you start seeing them going from hopelessness to some hope, and then, as the day progresses [and] as we wrap up the job, they are usually in a place where they are joyful. They are happy and relieved. They’re just excited that they can start seeing our home being put back together. Torres said his team helped some residents whose homes have been flooded out multiple times in the past several years, given that Hurricane Matthew devastated the region in October 2016. “A lot of people have put a lot of time and energy and finances into rebuilding their home from Hurricane Matthew,” he said. Angie Davis is one of those whose home was flooded by both Matthew and Florence. “Samaritan’s Purse helped me [during] both rounds of getting my home gutted out and sprayed and everything,” Davis said. Originally from southeastern Ohio, Davis has lived in South Carolina for six years. She said Florence took its toll on her home. I mean, you come and everything you worked so hard to do and had and purchased … it was all ruined. I don’t know, in my heart, I guess I truly need to say both times I was comforted by the Lord and prayers. And through that, it’s got me through so much, keeps my spirits high, and the whole bit. Just working and others, other people, people of the Lord, just keeps me inspired, keeps me inspired. Socastee resident John Fulknier, 70, was able to escape with his wife and two dogs. “We didn’t have time to get anything else,” Fulknier said. He first heard about Samaritan’s Purse through a neighbor. Fulknier, whose wife of 17 years is handicapped, said Samaritan’s Purse has been particularly helpful because neither of them is physically able to gut and clean their residence. 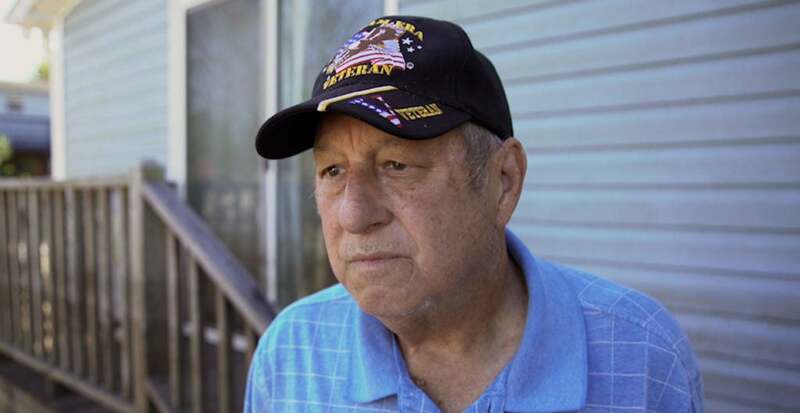 Fulknier, a military veteran, said that Hurricane Florence was the second-worst event of his life. Everything else I’ve been able to handle. This just came up so quickly and I had no time to prepare. And one day the ground’s dry and the next day there’s 5 feet of water back here, and my house is ruined. Carter, who led efforts to gut Nash’s home, said Jesus Christ’s love is what motivates Samaritan’s Purse teams. “The whole reason we do this is to show the love of Christ,” Carter said. Carter said that part of the beauty of the organization’s disaster-relief responses is the unselfish attitude of the volunteers who assist the teams. Once a team finishes working on a resident’s house, Torres said, the team presents a Bible that is signed by the volunteers and inscribed with personal notes. Carter said the beauty of the relief missions is the self-giving attitude and generosity of the volunteers, whether they are Christians or not. Some people are believers when you work with them, some aren’t. A fair number become believers after we leave because they want to know why people come and cheerfully work and get dirty and muddy. They’re working in a house that’s funky, wet, moldy. But they do it and they do it all day long and without grumbling, without complaining. They just come to work and show that love of Christ that’s in them.